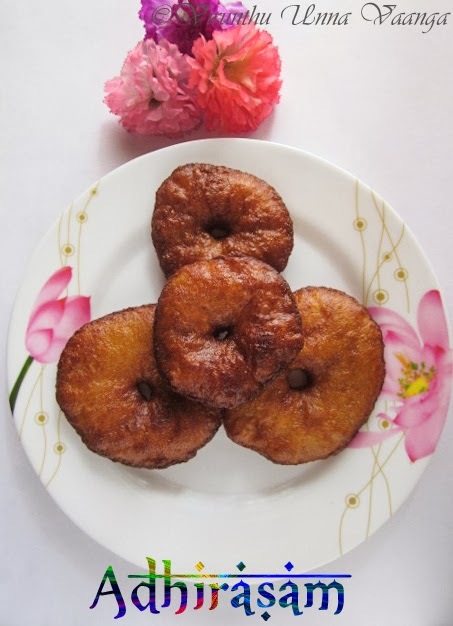 VIRUNTHU UNNA VAANGA: ADHIRASAM - TAMILNADU TRADITIONAL SWEET I DIWALI RECIPES I SNC CELEBRATION!!! 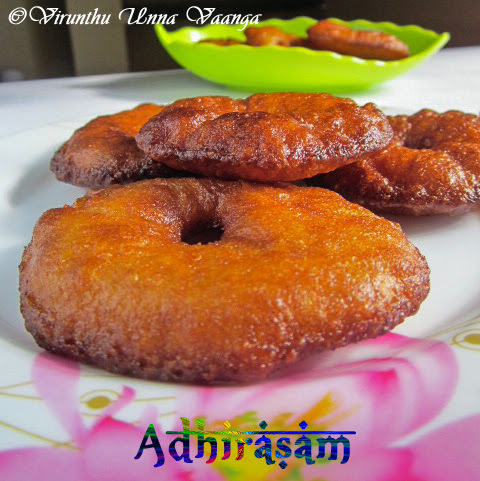 ADHIRASAM - TAMILNADU TRADITIONAL SWEET I DIWALI RECIPES I SNC CELEBRATION!!! Hi friends, here is the other sweet for the diwali... And this is very important and in every home of Tamil Nadu, diwali will not complete without this delicious sweet is none other than “ADHIRASAM”. It’s our Tamil Cuisine. 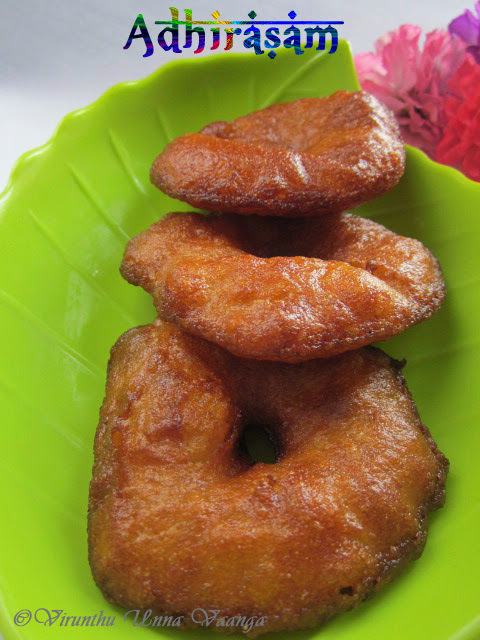 We made the special diwali sweet in traditional way, which means it takes about 2-3 days to get the fried adhirsam. 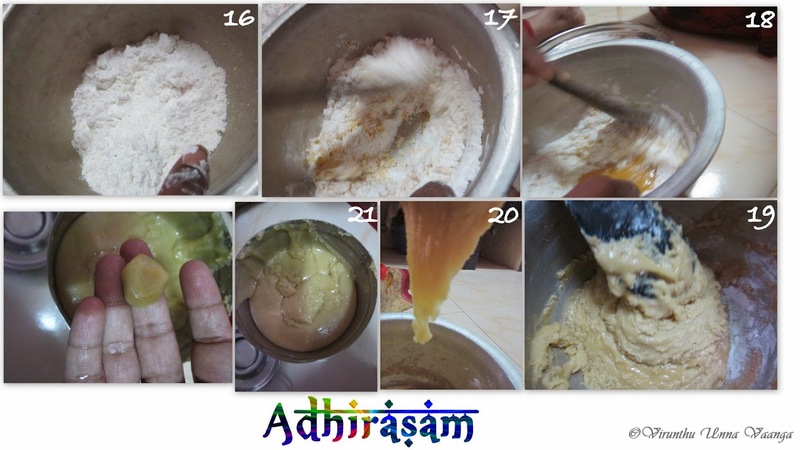 During, last diwali time Yashodha from Yashodha’s Kitchen was posted the adirasam for South Vs North Challenge – SNC, for Northern Team... And we are very happy that we are celebrating first year anniversary of SNC... 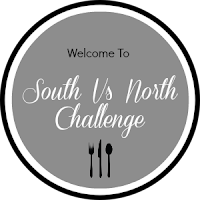 Feels very great, Congratulations and thanks to +Divya Pramil who is the brain child of the SNC and all my North and South friends who participated in the SNC... We learnt so many wonderful recipes from our North friends and had a good opportunity to try out new cuisines every month. 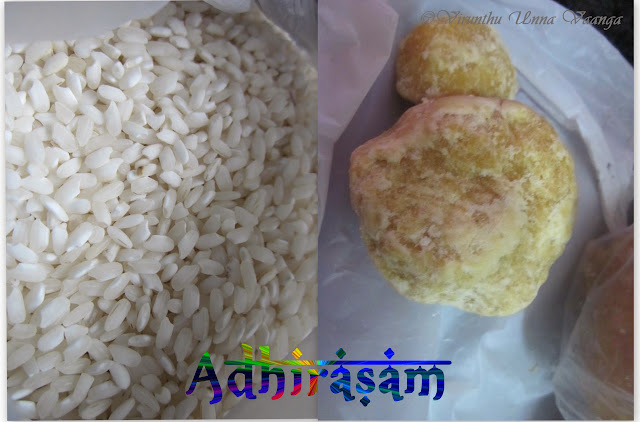 So for the celebration of SNC, am posting the adhirasam recipe. 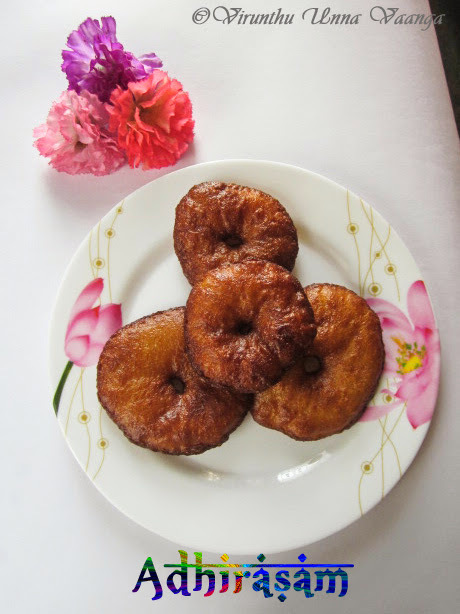 I am really very happy that nowadays, I can make good delicious traditional sweet. 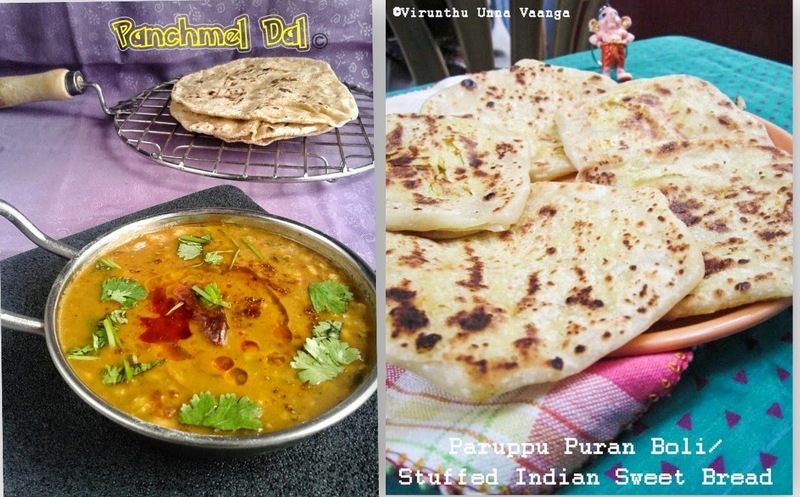 My mom and sithi (Aunt) are teaching me each and every traditional recipe, and am making it well till now... 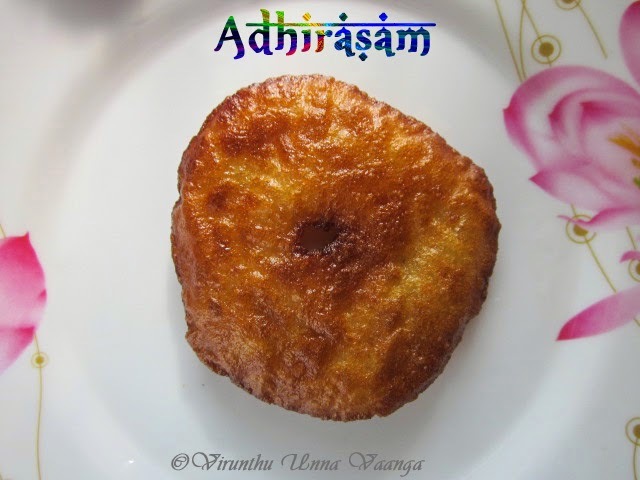 The perfect soft and delicious adhirasam needs 2-3 days prior to deep frying. After grinding and mixing with jaggery it needs to be rest condition at least 2 days to get the perfect texture, so that it will ferment. Soak the raw rice for at least for 2 hours, and then drain the rice. 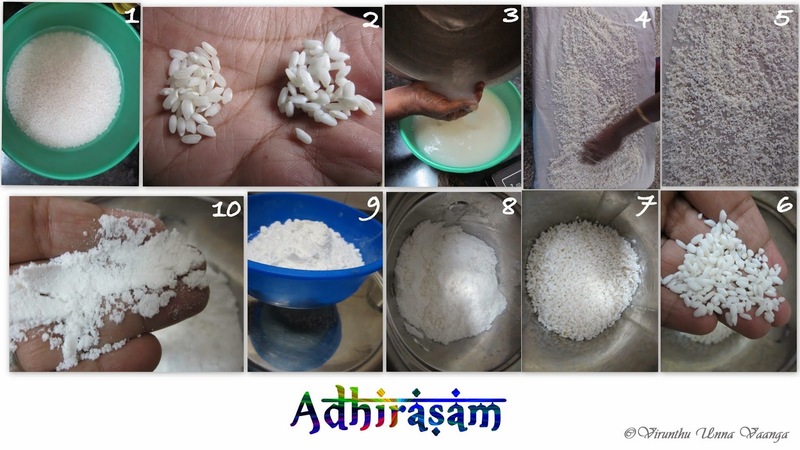 Put the clean cloth in a table and spread the rice completely as shown in the picture, and let it dry for 30 minutes, but careful don’t let them dry completely, it should be moisture. Grind it in a dry blender into a medium powder i.e. nor coarse or smooth. Sieve it and keep it aside. Take the grated jaggery into heavy bottom pan, add 2 Tbsp of water and let it dissolve. Stir it continuously till you see the frothy, now a drop the syrup in a bowl of water, if it’s settled down and can make ball of it (One string Consistency), switch off the flame. 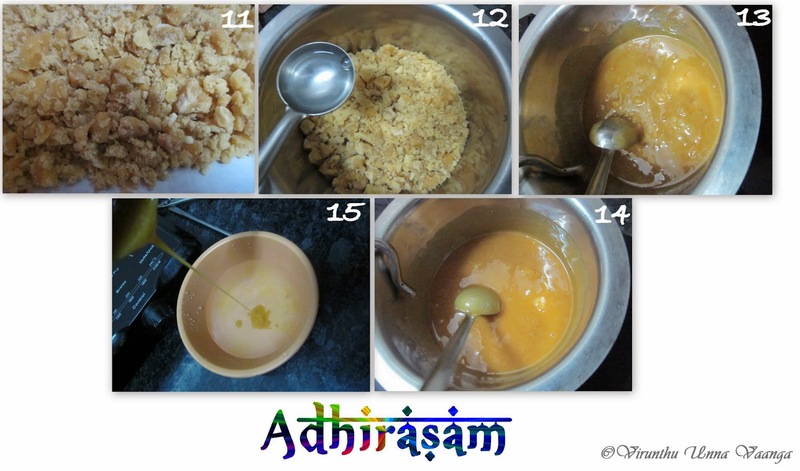 Take a little amount of rice in a wide mixing bowl and add little hot jaggery syrup and stir it with wooden ladle. Repeat the step till you finish the all flour not the sugar, the consistency should be like chapathi dough. Don’t add the syrup much than that. If you roll into ball of the dough, it should not be sticky. Now keep the dough for 2-3 days in room temperature. Take the dough, make equal size small balls. Keep ready the oil greased plastic sheet or banana leaf. Keep the ball on the sheet, dip your fingers in oil and flatten by hand into semi thick not too thin or too thick, if you wish make hole on center. 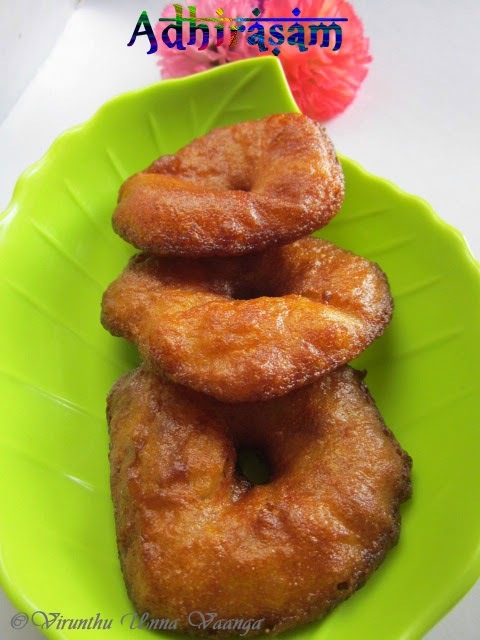 Gently put the dough into the hot oil and deep fry it golden brown on both side. Keep it in tissue paper and keep changing the tissue paper after it complete wet. 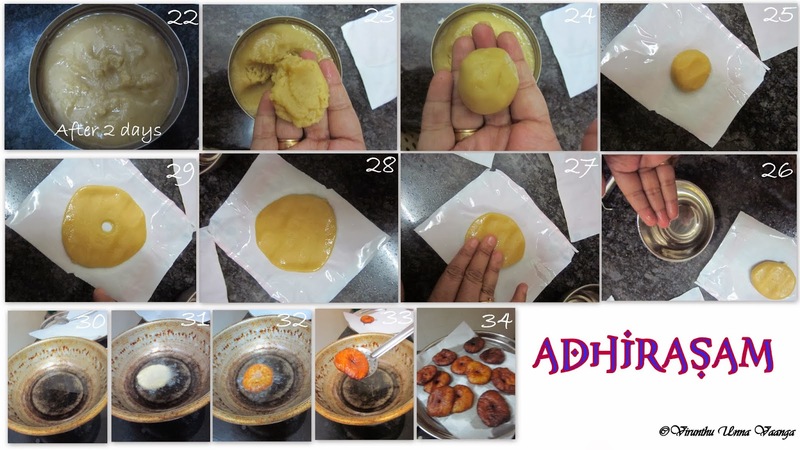 You can press the adhirasam with flat bowls, but we don’t do that for soft purpose. Don’t add more water; the mentioned amount is more enough. If you wish add 1 Tsp cardamom powder and ½ Tsp of Sukku (dry ginger powder) powder when mix the dough. If you need to do urgent, you can fry it after 12 hours, but soft texture needs 2 days. 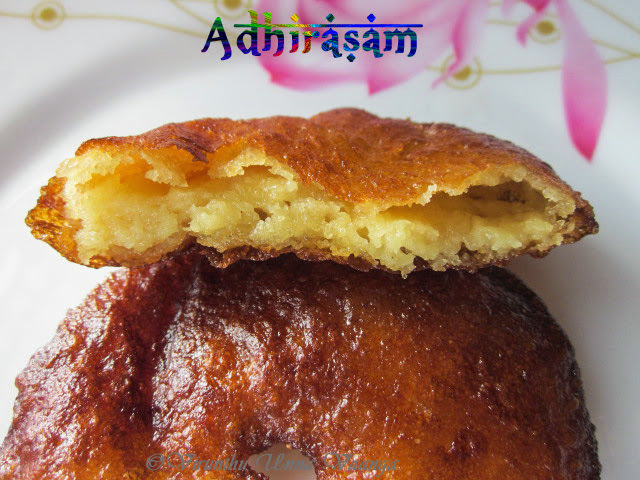 ENJOY THE EVERY BITE OF OUR TRADITIONAL SWEET ADHIRASAM!!! love to have adhirasam anytime.. looks too good.. Truly delicious. Wonderful pictorial presentation Viji dear. Wow.. I love it dear. Ver delicious. Very well prepared and explained. Lovely clicks. Wow! mouth watering here. Parcel some to me. super delicious and very very festive!!! perfect in time for Diwali!! 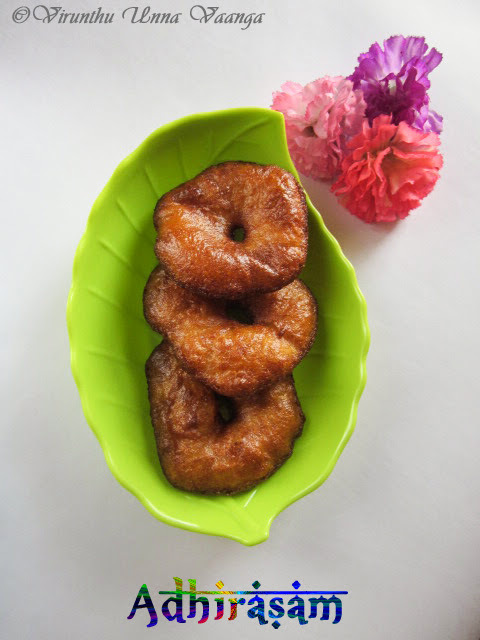 Tempting clicks and perfect Adhirasam Viji! Wanna grab some from the display! Delicious! 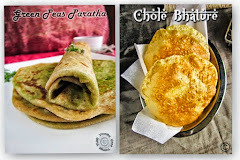 Omg, u r killing me with ur clicks...I want some rite now..pack me please. Beautifully made. Love its. The procedure reminds me of anarasa that we make in Karnataka and Maharashtra only they are dipped in poppy seeds before frying.